You'd be surprised how many puppies do this! Find out how your dogs 'poop-eating' habit gets started, why it can be dangerous, and what to do about it. If you're asking yourself 'WHY does my dog eat poop? ', you're not alone that's for sure! Because as nasty as it seems to us, for most puppies and dogs, coprophagia (eating their own feces and/or the feces of other dogs/cats/horses etc) seems perfectly normal. 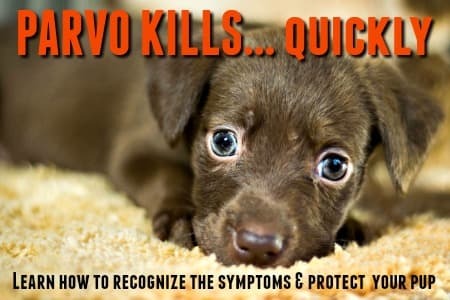 For many it's a behavior that they grow out of once they leave their momma and littermates, but for others it can become a habit, but it's a habit you need to discourage because at worst it can have serious health consequences... and at best it's just yukky! 'Coprophagia' is the proper name for stool eating, and you might (or might not!) be surprised to learn that it's a normal canine behavior. A momma dog keeps her nest/den clean by eating the feces of her young puppies. As they pups grow, they copy this behavior and try to 'help mom with the cleaning up'. Poop eating seems perfectly normal to them. Although, once weaned and out of the nest, many puppies tend to stop this practice, others continue the habit even when they've moved to their 'forever homes'. Generally puppies will forget about their desire to eat their feces within a few weeks, but for some it can become a long-lasting pattern that leaves their owners scratching their head and sighing... "WHY on earth is my puppy eating poop?" Is It Bad Or Dangerous For My Pup To Eat Poop? Generally speaking, coprophagia isn't dangerous, just unpleasant and 'icky'. This is especially true when your pup or dog just eats his own stool. BUT, if little Fido seems intent on snacking on every random poop he finds, or thinks 'kitty crunchies' from the cat litterbox are the best treats ever, then it can become hazardous to his health. Many of the most dangerous and contagious dog illnesses are transmitted through feces. If your pooch ingests the poop of a sick dog, he could get very ill himself. The same applies to cat poop, plus cat litter isn't a great thing to be swallowing at the best of times! It can 'clump' together and cause an intestinal blockage, or at the very least make your puppy vomit. Parasites such as worms can also be transmitted through the ingestion of feces, that is not something you want for your puppy. Why Does My Dog Eat Poop - Does He Have Worms? Sometimes coprophagia in a dog can be a side effect of a worm problem. A parasitic infestation makes a pup extra hungry because the worms are getting all the nutrition from his food. However, usually the puppy is already a 'poop-eater' anyway. Most puppies have some worms at some time, and these are generally taken care of by the routine puppy deworming which takes place at the same time as he receives his vaccinations. Is There Something Missing In His Diet? The answer to this is usually "No". The majority of puppies and dogs with coprophagia are fed good, nutritious food which provides a balanced diet. For a stray dog who has to fend for himself, and is often on the border of malnutrition, stool eating may be the result of extreme hunger and a need for nutrients. But for a well taken care of pet, it's highly unlikely. However, if your puppy is eating a food which contains a lot of additives, fillers and so on, a high proportion of that food is indigestible to him and a good percentage of it is passing through his digestive system pretty much untouched! When this happens, the stools may seem more attractive to your puppy, after all - they're made up of a lot of the ingredients he finds in his food bowl. Changing over to a high quality/premium dog food that your puppy can actually digest fully can be helpful in these instances. Be sure that you're feeding your pooch a high quality, nutritious diet. A good dog food is highly digestible and results in fewer stools, and those stools are definitely less attractive as potential snacks because they're not full of the undigested fillers and junk that cheaper, lower quality foods contain. Take a look at my 10 Best Dog Food Choices for more on this. Watch that you don't give your pup too much food. Overfeeding can result in undigested dog food in his feces, which makes them smell and taste really good to Fido! Scoop the poop from your yard promptly. Don't just leave it there and wait for the weekend (or whenever), to clean up. Do it on at least a daily basis. Keep your pup on a leash when you take him out. If he's a dedicated stool eater use the leash even if he's just going 'potty' in the back yard. If he tries to nibble on his stool, tell him "NO" firmly and 'pop' or tug his leash as a correction. Redirect his interest right away with a treat or a game. Try A Little Of The Hot Stuff! You can try pouring hot sauce (or something similar) onto the stool piles. It will make them a lot less appetizing to your puppy. Of course, if you're going to take the time and trouble to do this, it's just as easy to pick them up. Some people find that a bit of meat tenderizer sprinkled on their dogs' food can make the stools less palatable. To eliminate the stool eating, there are a few simple but effective products available that can be added to your dogs food. Once the food containing these products has passed through Fidos' digestive system, the resulting feces are very unappealing! 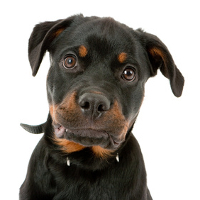 Home › puppy Behavior › Why Does My Dog Eat Poop? 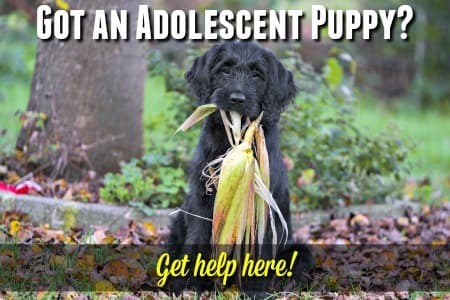 Home › Bringing Home A New Puppy › Why Does My Dog Eat Poop?